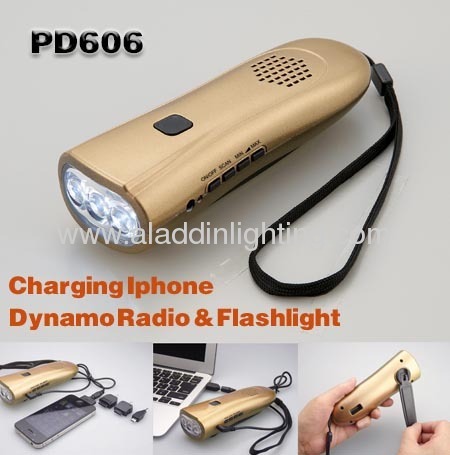 This product adopts brushless generator for power generation to charge its inside 1000mAh/3.7V chargeable lithium battery. The power stored is transformed to the LEDs via a switch to control its on and off and FM radio. Also it can change most of mobile phone, include smart phones. Cranking for power, low noise but high efficiency. 3 Ultra bright LED light. Controlled by electric switch, long life-span. Newfangled design which can charge the light by cranking, Never need batteries. Newfangled design which can charge the light by USB charger. 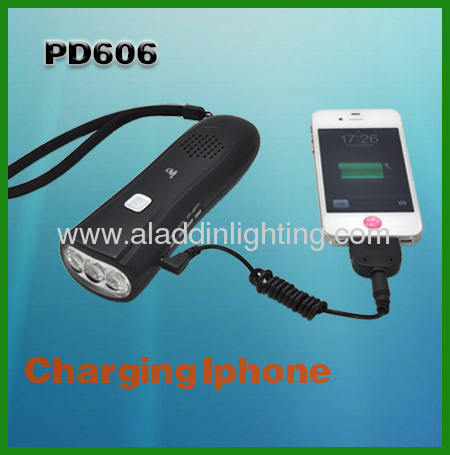 Newfangled design which can charge the mobile phone. the other hand at the speed of 3 circles per second to charge its inside battery. USB port to charge the internal battery via DC in port. Operation of the power switch: Press the "on/off" switch to turn on or off the radio. Station Search: Press "SCAN"to search the radio program. Volume adjusting: Press "VOL+" or "VOL-“ to adjust volume by single step.